Tennessee senator vacates, locks office amid renewed protest - We Resist. 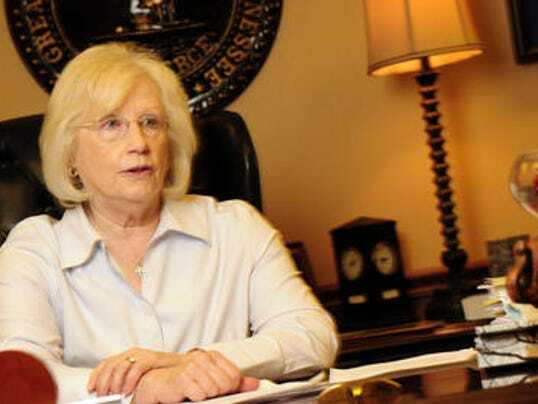 A Tennessee senator has locked up her state Capitol office amid a renewed feud with protesters. About a dozen people were involved in Tuesday’s protest at Republican Sen. Mae Beavers’ office. Some read civil rights writings and knocked on her door inside the office. Last week, Beavers and GOP Rep. Mark Pody abruptly ended their own news conference when protesters interrupted to oppose the lawmakers’ bathroom bill and legislation defining marriage as only between a man and a woman. Afterward, Beavers suggested the protesters should be imprisoned, spurring Tuesday’s sit-in. Beavers told Tuesday’s protesters she’d have them removed if they kept knocking. She said she was busy meeting with constituents. Beavers and staffers then left and locked up as protesters asked questions. Police blocked protesters as Beavers took the elevator.